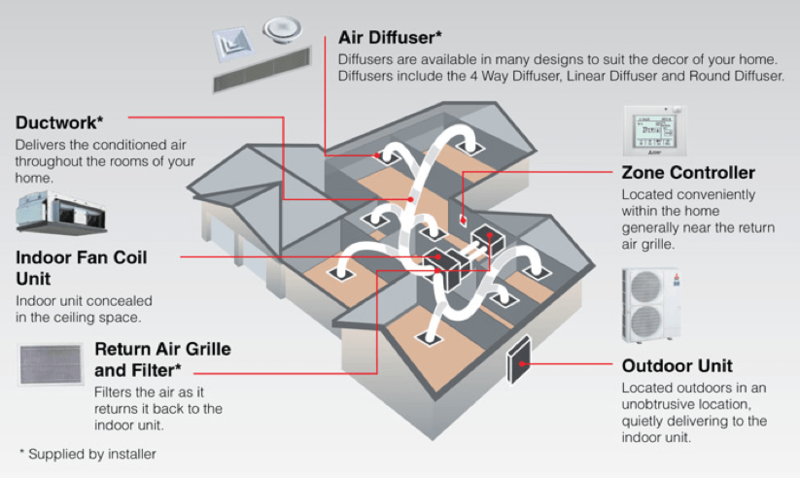 Why Ducted Air Conditioning Brisbane? Although there are various types of air conditioning systems available in Brisbane for homes, offices, warehouses, and schools, ducted air conditioning is one of the most common types. Many individuals have primarily favoured ducted air conditioning in Brisbane due to the innumerable benefits it offers. In general, ducted air conditioning has been synonymous with offering the owner perfect control of the indoor climate in their building. Since ducted air cons are usually quiet and inconspicuous, they fit perfectly into any building while silently performing their functions. The flexibility of the ducted systems also allows the installer to customise its functions based on the needs and preference of the users. If you want to enjoy the best air conditioning system, our experts at Air Conditioning Advisory Centre has recommended the use of ducted air con in Brisbane as they have proven to be efficient, maintainable, and affordable. This air conditioning system is highly versatile as it is easily used in homes, schools, offices, warehouses, and various other places. From small to large sizes, Air Conditioning Advisory Centre offers a full range of energy friendly ducted air conditioning solutions, depending on your requirements. If you need ducted air conditioning in Brisbane for an existing home or installed into a new home, get a quick and easy quote from us. Ducted air conditioning delivers the optimum in cooling with uninterrupted comfort and without wild fluctuations. It also achieves energy savings which result in lower running costs. A ducted air conditioning unit is designed to be user-friendly as it provides users with an ideal way to stay cool indoors at all time of the year. We understand the need to have the best ducted air conditioning in Brisbane for your convenience, and we strive to meet your needs. If you need a quick installation service or to replace your current deduct system, you need a reliable company that can deliver on time and within budget. Air Conditioning Advisory Centre is the most reliable option for you. Air Conditioning Advisory Centre offers a wide range of air conditioning services such as the design, installation, and maintenance of ducted air conditioning in Brisbane. You can enjoy a full range of air conditioning services at affordable prices, as we always customise our services to suit the budget of each client. Hurry now to contact us at Air Conditioning Advisory Centre for a consultation on your air conditioning system, as well as quotes for the various services we offer. At Air Conditioning Advisory Centre, we have established a great and lasting relationship with manufacturers of high-quality air conditioners; therefore, through our unrelenting efforts, the best products are always within reach of our customers. Even after we have helped you design and have installed the air conditioning system for your offices and warehouses in Brisbane, we still extend our reputable services to its maintenance. Are you unsure of the type of air conditioning suitable for your warehouse or office? Would you like to enjoy the services of the best air conditioner installation team in Brisbane? If yes, call us now at Air Conditioning Advisory Centre.